To tell you the story of St. Marcus Fine Foods Ltd, we have to travel back to 1983. It was here, more than three decades ago, that we’ll find a young butcher and the starting point of our history. Emory St. Marcus always did have a passion for the trade, and it was when he first found himself on the shores of England, that he decided to pursue that passion. That’s what encouraged him to open his small Butchery on the outskirts of Richmond Park in South West London. It wasn’t long until business flourished. It was more or less at this point, that another crucial change was right on the St. Marcus doorstep. Having taken note of the growing South African community in the surrounding area, Emory had an idea in place. That very idea was fuelled by the wonderful relationships he had formed with some of his South African customers. They had a longing for their home delicacies, that much was obvious, and he decided who better to provide for them? This takes us to the exact moment where we’d find Emory surrounded by fragrant herbs & spices. Not to mention slabs of Silverside in vinegar baths and passionately scribbled recipes on rustic workbenches. What may have been an overwhelming endeavour to some, was an exciting task that he had managed in no time. After he had mastered the core range of Biltong, Droëwors, Boerewors and Stokkies, he moved onto experimentation. He enjoyed concocting a variety of flavours, before sitting his family down as guinea pigs. Luckily for them, it was always a delicious attempt and so the range grew. 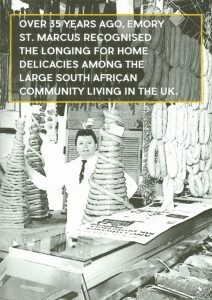 The ever-growing South African community was grateful, but their insatiable desire for a taste of home kept St. Marcus on its toes. That was around the time the business expanded to include imported groceries like Creme Soda, Ghost Pops and Peppermint Crisp. To this day, St. Marcus Fine Foods Ltd. continues to grow, experiment and perfect. 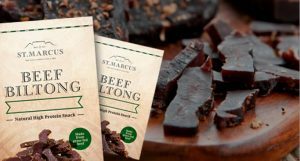 However, at the heart of St. Marcus, there will always be a butcher with a passion for food and a family business with a desire to give South Africans abroad a taste of home.